Companies which care for people and profits would recognize the importance which a clean, hygienic and healthy environment plays in getting the best out of their customers, staff and workers. It is this belief which has led us to offer you an essential range of proven Washroom and Toilet equipments. These products allow them to totally refresh themselves speedily, conveniently, hygienically and at least (installation, maintenance and operational) costs to the management. Besides providing total satisfaction, our product range ensures that your washroom or toilet need never smell “ugh” again even when the user (uses and) neglects them! Components: Fabrications- all stainless steel from solid, extruded brass, heavy chrome plated. ‘out-of-sight’ generally under the basin. Dispenses water immediately the hands come in position. Flow remains on while hands in position. Minimum 0.5 bar (about 7psig), max about 3 bar (about 42 psig). So that water does not splash even if water pressure is high. Operates on 220 VAC, 60cps, 1-phase. normal, 2-pin socket. Negligible power consumption. Ensure power supply under basin. Water flow stops after 1-minute of continuous use. Need more? 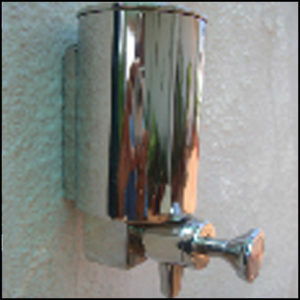 Withdraw hands and place under tap again. In-Line water Filter: Recommended. Included. A lever at the Solenoid Valve allows you to get water directly, in case of power failure with no back-up, defect in unit etc. Provision for auto switch-over to battery (chargeable, generally used in two wheelers) and trickle charge during normal times (Battery not included) In Kit form Available; can be installed in-a jiffy by any plumber/ electrician. Easy-to-follow, detailed, pictorial instructions, tools and plumber incentive included. Model: ATSL-C – Cover: Fabricated from thick, 16G, mirror finish stainless steel plate. Matt finish also on request. Model: ATD2-B/ ATD1-B – Twin (hot’n’cold) flow. Single flow. Model: AT-C – Sensor Housing: from solid, extruded brass, heavy chrome plated. 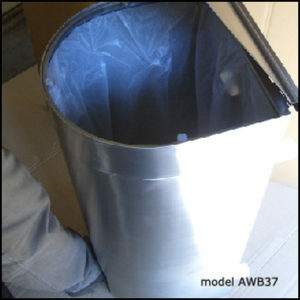 Model: AT-1W – Cover: Moulded ABS plastic. Also available in thick, 16G, mirror finish stainless steel plate. Matt finish on request. Components: Machinings- from stainless steel and solid, extruded brass, heavy chrome plated. Improve Hygiene – Generally, no one operates the manual flushing lever so it is important that flushing takes place automatically every time the facility is used. Auto-urinal-flush ensures this happens. 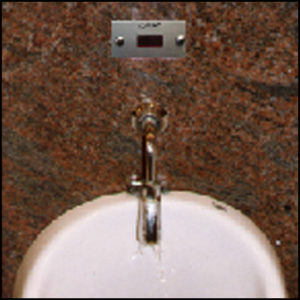 Optimal use of Water – Therefore, it uses just enough water to flush clean effectively. This installation is especially important when limited water is available. Convenience – The user does his job and moves on. The autoflush does its job and stays put. Provision for power back-up through a (two-wheeler) chargeable battery for auto switch over in case of power failure; battery on trickle charge during regular power supply. Cost Effective – Since it uses only that quantity of water which is minimally required, it is a least-cost solution. Fixed time flushings, though much cheaper in installation, wastes more water since flushing times may not coincide with the activity. There is nothing for the user to spoil. Easy installation – Can be done by a local plumber by following our easy-to-follow instructions. Foot pedal operated dust bin. Ideal Locations: For all locations where people move about. You cannot prevent people littering but you can contain it and maintain a high level of ambient cleanliness. For classy Offices, Factories, Restaurants, Hotels, Hospitals etc. actually! Lid: Lightweight aluminium, powder-coated for finish and durability. 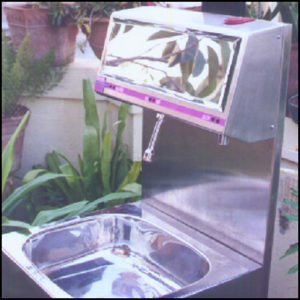 Can also be offered in stainless steel, on specific request only, at no additional cost. Fabrications: Fully in thick, 16G stainless steel for that straightness and high quality mirror finish. Matt finish also available. view. Lid-Cap to be disengaged & lifted for removing/ replacing polybag. Proper hands cleaning is a 3-step affair – Soaping, Washing and Drying. Usually when one visits a toilet (or washroom) one normally carries out one or more functions. But when an individual’s personal cleanliness and hygiene impacts a production process, as in pharmaceutical, food processing industry, etc. then it is imperative that his hands are really clean. When a large group of people are being served food, as in buffets in hotels or in a food bazaar in exhibitions, provision of this facility is equally necessary to offer convenience to users, tidiness of surroundings and a touch of class. It is a need-based, essential and a truly innovative product. Crafted from tough, 16G thick 304 Stainless Steel, it is an investment for a lifetime. It allows you to clean your hands thoroughly, conveniently and effectively. Period. Even lazy people would use it. Those establishments which would install the Hands Clean Station would send a clear signal to their customers, workers and visitors that they are sensitive to their most basic needs and that they . . Care. It is an ideal Face Fresh facility as well! OPT1 – only the Hands Clean Unit (can only be wall mounted). 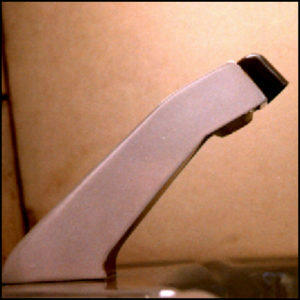 OPT3 – Hands Clean Unit mounted on Wall Panel which is mounted on the Support Bracket; the complete Hands Clean Station. First step to hygiene and cleanliness. No amount of washing, rinsing etc would be of any use unless the hands are first thoroughly soaped and the hands rubbed together. What should be used, soap bars or liquid soap? Apparently either should be OK though the chances of some dirt, germs, bacteria etc remaining on the bar after the previous user has used it is always there. Similar problem, though to a lesser extent, could be there with the use of manual push-button soap dispensers as well (the palm pushing the plunger). Ideally, the use of an automatic liquid soap dispenser would eliminate all problems of cross-contamination. Liquid Soap: Can use own brand. While using viscous soaps like Lifebuoy, Dettol etc. dilute 1:1 with water. Cover: Only in thick, 16G Stainless Steel, matt or mirror finish. Fabrications: Machined from solid extruded brass, thick chrome plated. Ideal Locations: Absolutely for any washroom or toilet but with low traffic areas. Container: Round, in thick 2mm SS pipe. Dispension: On release, in palm of hand. Single hand operation. About 0.5ml per press; enough for one hand wash. Want more? Press again. Minimum misuse. Each ‘industry’ claims that their method gives the best result in terms of hygiene, carrying/ not-carrying germs/bacteria, cost effectiveness etc. It is like saying that only breakfast or lunch or dinner is the best meal! It is for the buyer (installer) to determine his criteria and determine to meet it by installing one product group exclusively or more, in combo. We are, of course, rooting for hand dryers! Passive drying. Thorough rubbing/ 1drying possible but only if used for 1specified minimum time. Even if germs could ‘grow’ within dryer they will be killed while passing through heater. Air temp at exit, 50 – 70 degC above ambient temperature. Delivers sterilised air for safe drying. Negligible running cost, saves money. (no labour, no filling). Fit’n’Forget. Practically maintenance free. Available 24/7. No stock-outs. Highest installation cost. Lasts 10+ yrs! For all locations where people prefer a personalised approach to wiping hands. Since you cannot prevent littering you can at least contain it. 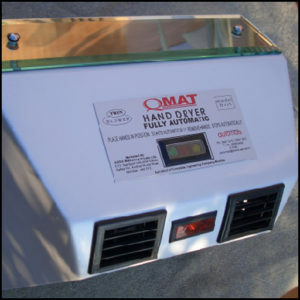 It is, therefore, recommended that you place a QMAT Auto-Waste Bin around to maintain a high level of ambient cleanliness. For classy Offices, Restaurants, Hotels, Hospitals etc. Fabrications: Fully in thick, 16G stainless for that straightness and high quality mirror finish. Matt finish also available. Configuration: Front lid opens to allow stacking requisite number of c-shaped tissues, folded portion facing down, into unit. (The fold ‘opens’ out for easy pulling by user). Push back the cover and it snaps fit due to the dead weight locking pin. Proper design to allow tissue to split ‘open’ for easy holding and pulling out by user.